It is important to visually inspect the cable winch before it is being used. As cable winches are used for a variety of purposes, it is important that it is safe to use and protected as well. The following article would teach you to take care of a cable winch. Apply grease to the axle and gears before storing for an extended period. That is because the gears need to be lubricated and smooth so that they do not rust and can be in working order. Also, check the movement of the ratchet switch pawl and the hook safety latches. 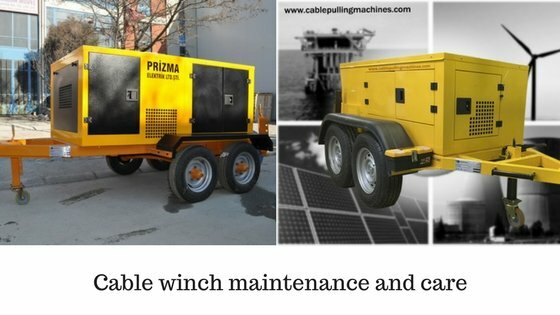 The cable winch should be stored in a cool and dry place so that there is no moisture and the winch is not damaged. Cable winch pullers are usually used for pulling high-tension wires that need to be installed in high areas. They can pull both light ropes as well as heavy ropes as per requirements. They are lightweight, long lasting and durable enough. These cable winches have a 2-year warranty period and can sustain for a longer time as well.